Stanisław Witkiewicz made many self-portraits throughout his life in order to capture and express inner psychic states. 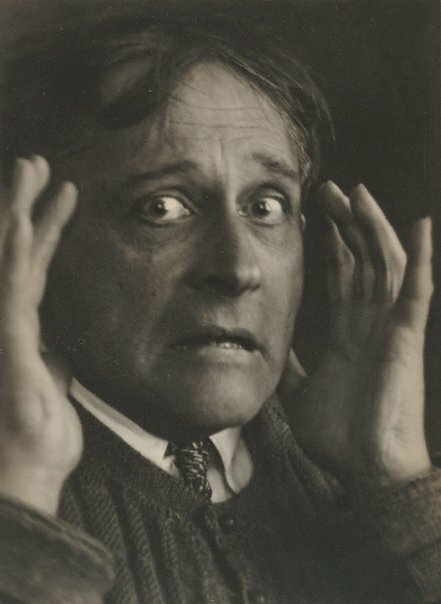 Witkiewicz’s involvement in Formist theatre, a precursor to absurdist theatre, seems to have given a particular intensity to the way in which he depicted himself and others through photography. Witkiewicz was born in Warsaw into a cultured Polish family who moved to Zakopane in 1890. It was here that he began writing theatrical productions and held his first exhibition of landscape paintings. In 1903 he completed the first of many texts titled ‘Dreams of an unproductive man/a metaphysical consideration’. Between 1912 and 1913 he abandoned landscape painting, taking a series of ‘metaphysical’ photographic portraits and self-portraits. Witkiewicz travelled widely including an expedition to Australia via Ceylon with the anthropologist Bronisław Malinowsk in 1914 where he served as photographer and draftsman. At the outbreak of World War 1, Witkiewicz returned to Europe to enroll in the officers' training school in St Petersburg. Though he never reached the expedition's primary destination, New Guinea, this trip would impact his aesthetic philosophy. After returning to Zakopane, Witkiewicz became an active member of the avant-garde painters’ group, the Formists. This period was a most productive and fertile time in terms of the artist’s creativity. It was under his initiative that the Formist Theatre was founded in Zakopane in 1925. It was during the latter part of his life that he took a series of staged photographs of himself in collaboration with Józef Jan Głogowski. Their joint photographic sessions were to produce a notable body of work. Głogowski was a non-professional photographer who had produced many portraits of his family and friends, however his photographic collaborations with Witkiewicz after 1931 are considered his best work. Judy Annear, Photography: Art Gallery of New South Wales Collection , 'The photograph and portraiture', pg.15-31, Sydney, 2007, 30 (illus.). Galerie Berinson, Berlin, Stanislaw Ignacy Witkiewicz (1885-1939): photographs , 2003, 11 (illus. ).